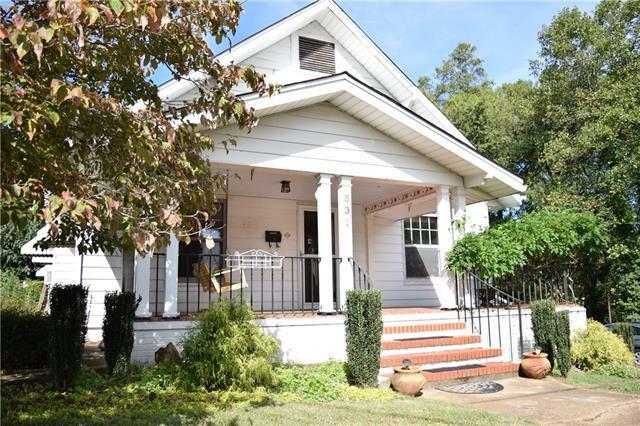 Charm and Character in this downtown Hickory home. Convenient to downtown shopping/dining, parks, Hickory Community Theatre and the future City Walk. This location is perfect for anyone wanting to be near shops, dining, Farmers Market & sidewalks. Enjoy your mornings sitting on your Rocking Chair Front Porch or grill out in the evenings on your side patio area. The back & side yard offers privacy and character with raised brick planting beds and unique concrete statues. Main Level Living w/Living Room, Den, Formal Dining Room, Kitchen, Bedrooms and fantastic tiled Full Bath. Second level offers 2 additional rooms and a half bath that could be converted into a full bath. Exterior features: storage shed, carport & plenty of parking area. Basement offers: Storage area & Workshop with interior/exterior access. Gas Heat (Piedmont Nat. Gas), City of Hickory Water/Sewer. Floor Plan available. Call to day for your private appointment!